Summary: Oslo is sweltering in the summer heat when a young woman is murdered in her flat. One finger has been cut off and a tiny red diamond in the shape of a pentagram—a five-pointed star—is found under her eyelid. Detective Harry Hole is assigned the case with Tom Waaler, a colleague he neither likes nor trusts. He believes Tom is behind a gang of arms smugglers—and the murder of his partner. But Harry, an off-the-rails alcoholic, is barely holding on to his job and has little choice but to play nice. Five days later, another woman is reported missing. When her severed finger is found adorned with a star-shaped red diamond ring, Harry fears a serial killer is on the loose. Determined to find the killer and expose the crooked Tom Waaler, Harry discovers the two investigations melding in unexpected ways. But pursuing the truth comes at a price, and soon Harry finds himself on the run and forced to make difficult decisions about a future he may not live to see. 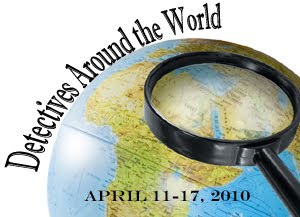 When I discovered that Jen from Jen's Book Thoughts was organizing a Detectives Around the World Week, I totally wanted to be part of it! I used to read a ton of mystery books in my pre-blogging days, but I've found that I don't read as many of them as I used to (for whatever reason.) I thought this week would be a wonderful opportunity for me to read a detective book and hopefully find a new favorite author, and my expectations were definitely met! I can't even begin to tell you how excited I am about the book I just read. 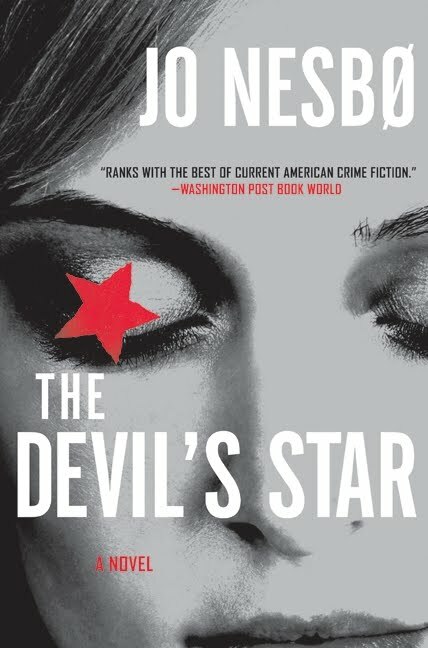 It's called THE DEVIL'S STAR by Jo Nesbo, and it is absolutely incredible -- definitely one of the best books that I've read so far this year. I really shouldn't be surprised by how good this book was because Jo Nesbo has won quite a few awards for his writing. I've also seen so much good press surrounding this book, but I still managed to be a little shocked by how much I enjoyed it. I could write pages about the things in this book that made it extra-special to me, but it might be better for you to just read it. In the meantime, I'll just try to highlight a few. I think what I loved the most about this book was the character of Detective Harry Hole. Talk about a flawed main character. Hole is brilliant detective who at the same time is an alcoholic -- almost to the point of ruining his life. He almost loses his job as well as his love interest, and I definitely got the impression that he was a desperate man. He is also carrying a great deal of baggage from his past including trying to cope with the death of family members and a co-worker. I was absolutely fascinated by Hole and his actions, and I think he's one of the most interesting detective characters that I've ever encountered in my reading. Another impressive thing about THE DEVIL'S STAR has to be Nesbo's writing style --I loved it and was often times blown away by this book. The storyline and mystery angle of the book were intriguing, there were lots of twists and turns that kept me guessing, and the novel was perfectly paced. In fact, there were quite a few subplots going on too, and I loved how Nesbo brought it all together by the end of the book. It was everything I hoped to find in a mystery book. However, it wasn't just Nesbo's storytelling ability that impressed me. He is just a really good writer too. His dialogue is terrific and very believable, and his descriptions of just about everything were so good that I could see this novel taking place in my mind. On top of those things, I actually found some symbolism and recurring themes in this novel that were very pleasant surprises for a "detective story." And one of the best things about this novel was how Nesbo used the setting to set the mood. I probably could have included this last highlight as part of the writing one; however, I feel as if it deserves to be singled out. I realize that many mystery writers heavily depend on the setting to establish the feel of their story; however, Nesbo brings that to an entirely different level. I would almost go so far as to say that Oslo is another character in this book. THE DEVIL'S STAR takes place during the holiday time in Oslo when the city is almost deserted. The temperature was sweltering, and I could almost feel the heat because of Nesbo's descriptions. In addition, I appreciated how Nesbo referenced the various sites around the city when writing about Hole's adventures. I am not at all familiar with Oslo, and this book brought the city to life for me....but more on that tomorrow! THE DEVIL'S STAR is actually the fifth book in the Harry Hole series (there are currently eight in all), and I'm usually not a big fan of reading a series out of order. However, since THE DEVIL'S STAR is the latest release here in the U.S. and I just happened to have a copy, I decided to read it for Detectives Around the World Week. I thought Nesbo did an excellent job of catching up the reader on the past, and I can honestly say that I didn't feel as if I needed to read the series in order. Having said that, I'm hooked and can't wait to go back and start the series from the beginning because I love Nesbo's writing style and the character of Harry Hole. I am a huge fan of Michael Connelly's (he's one of my favorite authors), and I have to say that Jo Nesbo is right up there with Mr. Connelly in both writing style and character development. In fact, do I dare even say that this book might be better than the recent Connelly ones that I've read? I highly recommend this book to anyone who enjoys detective stories and complicated mysteries with complex characters. Just trust me on this one -- THE DEVIL'S STAR is amazing! So what the bloggers have done in this theme week is identify a detective they were interested in, read at least one book with that detective to review, and then they've looked at the detective's setting. Throughout the week they'll be sharing their reviews and settings with you in an array of different ways. You'll get to see recipes and maps and location highlights of locations from the United States to Mexico to France to Greece and beyond. There will also be contests scattered throughout the week, so be on the look out for those as well. I hope that you'll travel through our world of bloggers. Share your thoughts on detectives you know, learn about a detective you didn't know before, maybe even learn about a blogger you didn't know before, and tell all your friends. There's a world of detectives just waiting for you to find them at your local bookstore or library. Wow, an author who's as good as Michael Connelly! I need to check Nesbo's work out - of course, I'd want to start from the beginning of the series. LOL!!! My comment was going to be *exactly* what Kathy already wrote! The comparison to Connelly won me over, along with your enthusiastic review, and I definitely want to start from the beginning. I love Scandinavia, so that's another plus. I, too, am definitely intrigued. I love Scandinavia, so I was already interested, but this sounds like a good series. I love Connelly as well (especially Harry Bosch) so you have my attention. I love a tortured, damaged protagonist...I don't want any goody-goodies. As far as sub-plots are concernced, I don't mind a few, but some authors take things too far and it gets distracting. Lastly, about the atmosphere. That can completely take a mystery from being OK to top-notch. I like ones that make you feel you have actually been there. Ones that give you the cold chills. I have heard both good and bad on this book, but you have really swayed my opinion! Nice job! It sure does seem that alcoholism and detective work go together - in books, at any rate! Julie, I've been hearing so many good things about this author. He's been on a US tour and I've read several accounts of his bookstore visits and also reviews of his books. I'm glad you are participating in Jen's event and thank you for your enthusiastic review of Jo Nesbo's latest US publication. I'm a sucker for a good setting in a mystery. I love it when the author combines it into the story so well and then I learn something too. Like...Oslo, sweltering? Never thought about Oslo being hot. Thanks for sharing! I started reading Jo Nesbø last year and introduced a colleague to him as well. Now my colleague wants me to hurry up and read THE DEVIL'S STAR so he can read it! It looks like a great read...I enjoy Connelly etc too, I'll have to check it out. Wow, this is an awesome review. You must have really enjoyed this mystery and the character. I have not read this author before, but I guess I should be since I am participating in the Thriller/Suspense challenge. I'm going to put this one on the To-read list. I love a mystery where the setting is integral to the story. Thanks for the review.